The only other game I tracked this season where MSU had a better defensive effort was the nearly unwatchable 58-43 win against Wisconsin in early March. 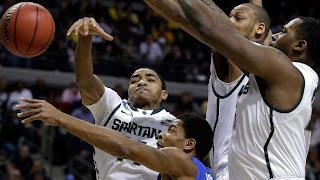 MSU's defensive efficiency was 66.4 that day compared to 69.0 against Memphis. That said, I'm sure Ken Pomeroy would find a way to make the two numbers equal since the latter game was played on a neutral site versus the home game at the Breslin Center.